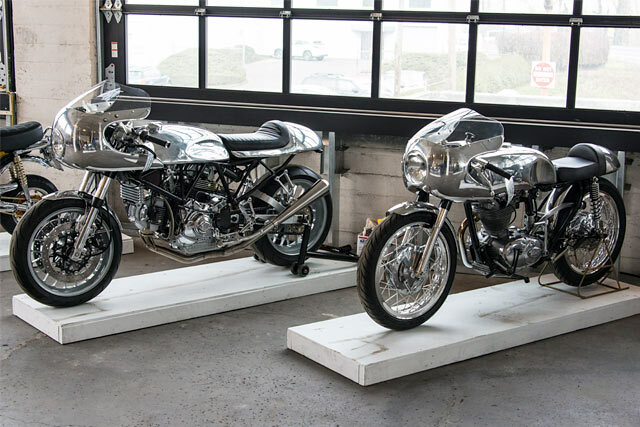 How many 21-year-olds do you know with a killer workshop and an amazing bike collection? The answer is probably zero. That’s because – unlike other things in life – getting older seems to be a distinct benefit in the bike scene. 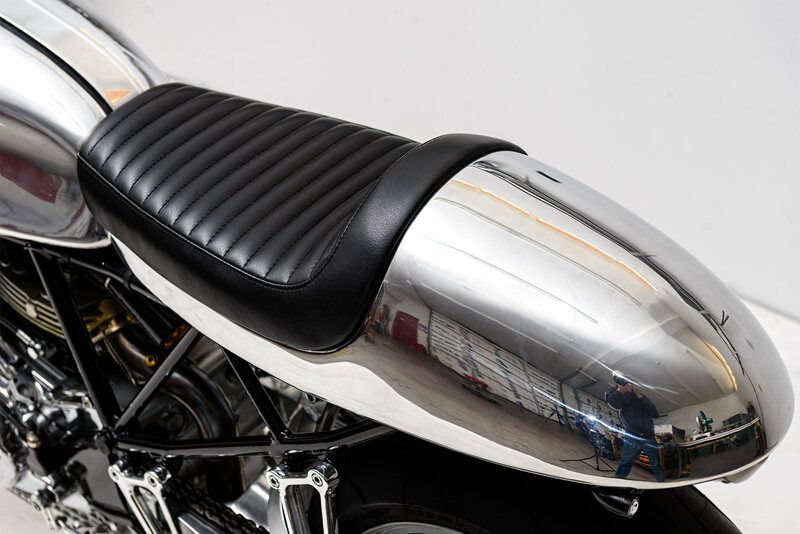 With no more kids, years of riding experience under your belt and the mortgage paid off, many of us find ourselves in a position where those dream bikes we’ve always wanted are finally within reach. Not only that, but you also have the time to actually work on the damn things. 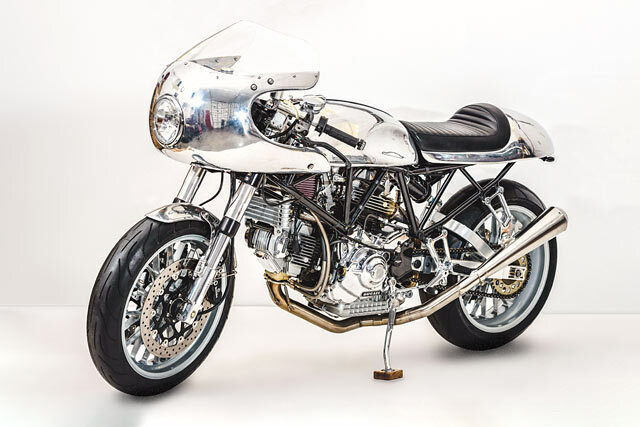 California’s Stephen Brisken knows just what we mean and this very shiny Ducati 900 Super Sport is one massive testament to it. “I am a retired guy with lots of time to waste building custom bikes and maintaining a small collection,” says the very lucky Stephen from his newly minted man cave. “My shop is part of a large metal barn. I have been able to insulate, drywall and heat a good portion of the space. The shop is divided into two areas. One is for the messy work of cutting, grinding, polishing and the like. 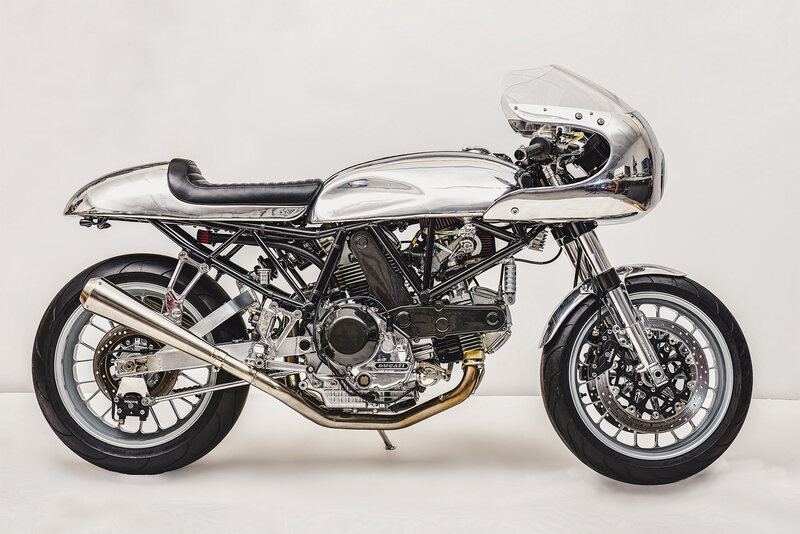 The other area is closed off from the first and is my assembly area with two bike lifts and hand tools.” And what you’re looking at right now is the latest progeny of this very cool little set-up; a ‘97 Ducati 900 SS fared cafe which Steve calls ‘The 900’. 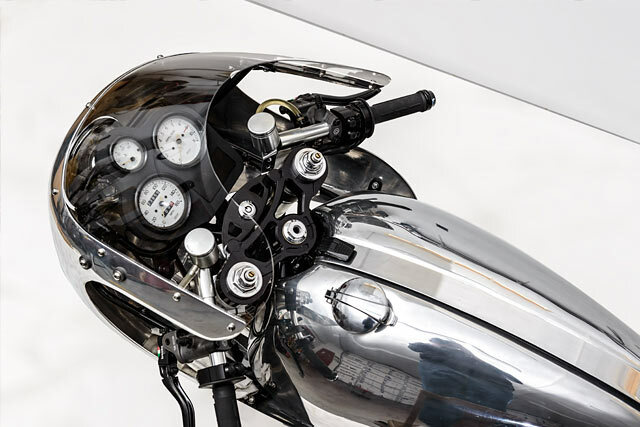 Steve purchased the bike through Craigslist from a track day rider in Southern California who was looking to upgrade to a finer example of the same model. “It was perfect for me; I purchased it through photos and phone conversations without actually seeing it in person and unbelievably, it was just as described and completely disappointment free.” Thank you, human race. 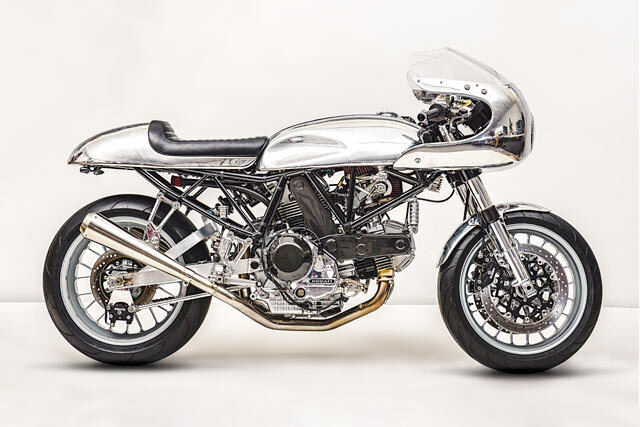 “Once I settled on the 900SS Ducati as a basis for the build I spent a bunch of time scouring the web for photos of other customs using the same starting point. I came across a few bikes that stood out. What they had in common was a very straight-line layout of the frame, seat, tank and fairing.” One of the bikes Steve found was built by Revival Cycles in 2015 using a 1997 Ducati 900SS, called ‘J63.’ From memory, they used their own custom frame with the engine from the old Ducati and – as Steve correctly points out – it was straighter than an arrow from the gods. 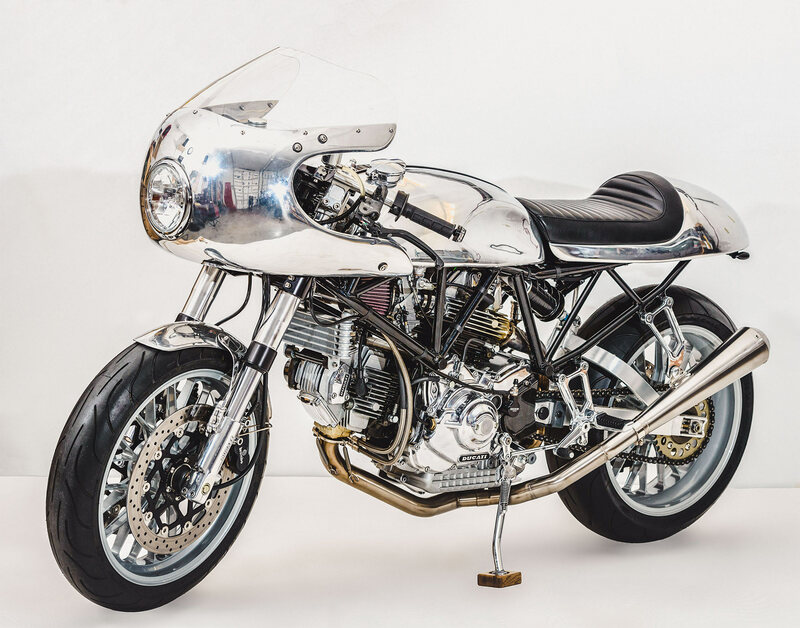 At this point that lovely Italian motor was removed and the top end was professionally modified by Jason Koschnitzke at VR Garage with enlarged cylinders, high-compression pistons, oversize valves, performance cams and a port and polish of the heads. 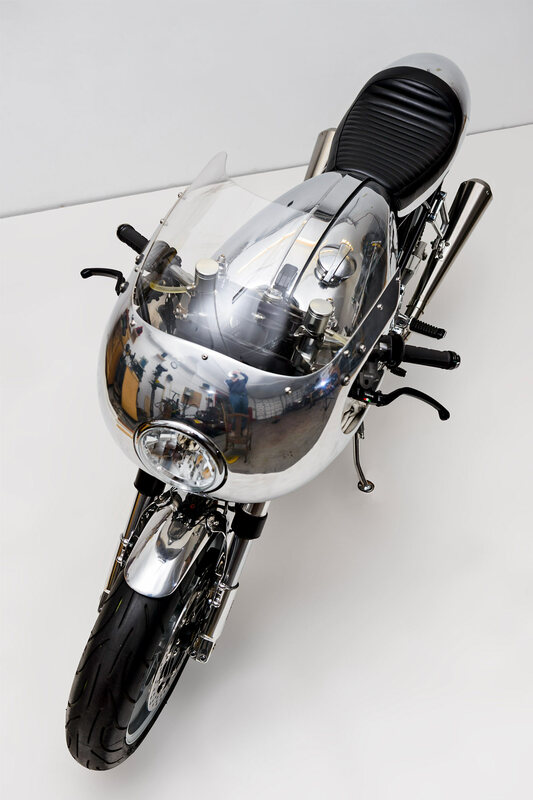 If a job’s worth doing… “Once the engine was back in the frame, assembly began,” continues Stephen. 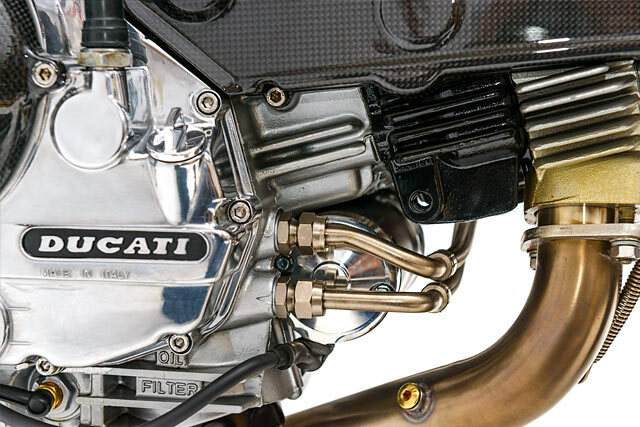 “An enlarged exhaust and flat slide carbs were mounted on to short manifolds. 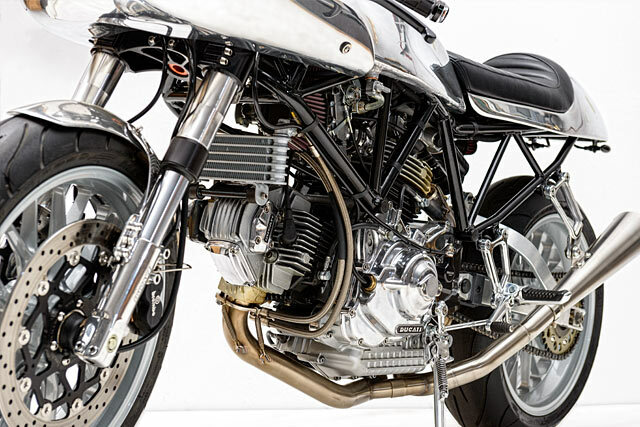 Almost all of the components were upgraded from stock including the hand controls, triple clamps, wheels, suspension, electrical and ignition system, lighting…” And by all accounts, once they got the carbs dialed in, the bike took on a whole new demeanor. “It is fast and really fun to ride,” says Steve with a broad smile on his dial. “I had decided on many of the components before starting, but I didn’t know if they would make a cohesive-looking and performing machine. Of course, there were parts that didn’t give the desired look or function and needed to be replaced. 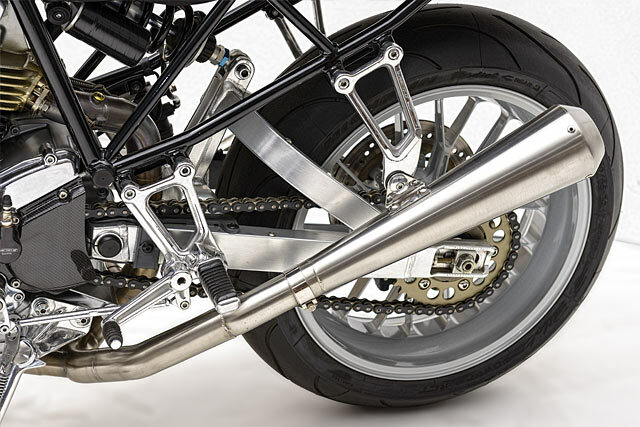 This included the rear-sets, grips, electrical components and some color combinations. In the end the best part of the finished bike was seeing it all come together in what is, for me, a very good-looking and functioning machine.” Believe us, Stephen; it’s not just you that thinks that. Not by a long stretch.